Bobby Cannavale in The Hairy Ape. There’s something about our time that doesn’t favor expressionism, especially in mainstream theater. The distortion of perspective and the inflation of emotional state that we may enjoy in paintings often feel onstage like gloomy satire. We are mostly realists — not in reality, of course, just in our popular entertainment. We are more comfortable with the couch and the bedroom than the jail and the smokestack. This makes Eugene O’Neill’s 1922 expressionist play The Hairy Ape, which opens tonight in a staggering, last-word revival starring Bobby Cannavale at the Park Avenue Armory, a difficult work to put over. It is not just expressionist but aggressively and experimentally so; O’Neill lavished so much attention on its style that the content begins to seem naïve by comparison. Not that there is much content. It’s more a timeline than a tale, a stop-motion autopsy of the working class in the machine age. The cause of death is surprisingly trivial: A brutish fireman on an ocean liner is laid low by a slumming dilettante heiress who gets a peek at him in the stokehole and calls him a “filthy beast.” Seeking revenge and a new place to “fit in,” this fireman, called Yank, further disintegrates as he discovers that without his animal confidence and vitality he belongs nowhere. To the rich on Fifth Avenue he’s invisible (they say “I beg your pardon” even when he tries to harass them); the socialists belowdecks despair of his ignorance; he’s even too uncouth for the radically democratic Wobblies. He self-destructs — or, really, commits suicide by proxy, with all of society his accomplice. Choke off dat noise! Where d’yuh get dat beer stuff? Beer, hell! Beer’s for goils — and Dutchmen. Me for somep’n wit a kick to it! Gimme a drink, one of youse guys. 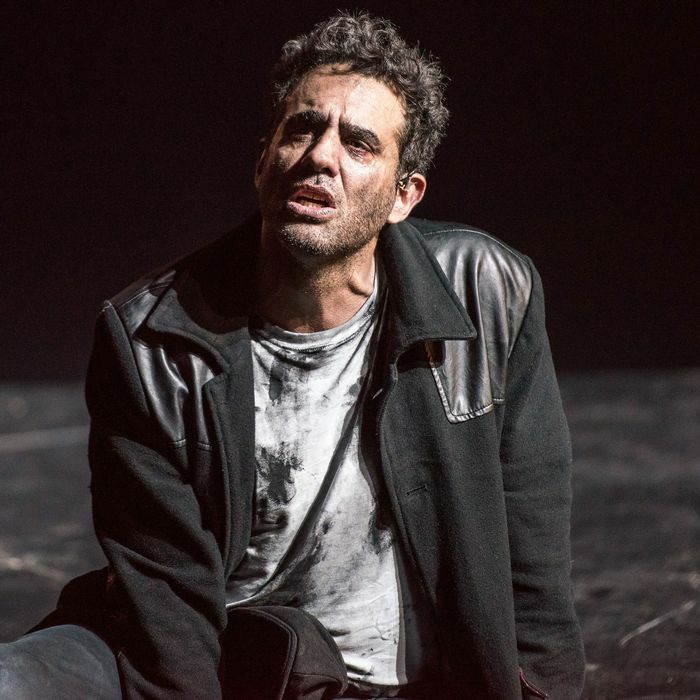 That Cannavale gets his mouth around the exaggerated dialect and makes it sing is a major accomplishment but perhaps no surprise; he has always been a very musical actor. He is also, here, an overwhelmingly physical one, not just in his apey intensity but in the semi-independence of his limbs, which wave and signal and climb him up walls without apparent direction from his brain. There’s something of a conflict, or perhaps a compromise in that: His body is giving us expressionism while his smooth interpretation of the speech is giving us realism, or as close as he can get. You could argue that this is what O’Neill wanted, or at least what he needed; in any case, it anchors a production, gorgeously directed by Richard Jones, that is otherwise full-tilt expressionism on the grandest scale imaginable. But the everyone’s-talking-about-it element of the design is the turntable, which operates as a kind of conveyor belt, displaying each new scene like the sole suitcase on a cosmic baggage carousel. It’s a neat trick, echoing the theme of industrialization and suggesting forced marches while also allowing more visual variety (and swifter changes) than a conventional production could achieve. The stokehole is rendered as a shoebox diorama, its ten firemen brought to us in mid-freeze, or perhaps mid-frieze, straining motionlessly at their labor like figures in ancient architectural carvings. The promenade deck in which we meet the spoiled steel heiress — “a waste product in the Bessemer process,” she tells us — is indicated not by funnels or lounge chairs but by a series of 14-foot-high letters spelling the name of her father’s steel company. (He also owns the liner.) We nevertheless get all we need to know from the cawing of seabirds (sound design by Sarah Angliss) and from Becky Ann Baker, who as the heiress’s disdainful chaperone occasionally touches her stomach as if she were going to be seasick. The performances of the other supporting actors are just as subtly calibrated to honor the darkness of the material without letting it tip into murk: David Costabile as the dipso Irish sage who remembers the good old (pre-machine) days of sailing; Henry Stram as the Wobbly secretary, leery of infiltration; Catherine Combs as the petulant heiress, eager do good if only she knew how (and it weren’t so upsetting). Phil Hill in a role it would be spoilerish to specify is also sensational. All of them maintain a slightly brightened performance level that matches the production’s design and refreshes the emotional palate. What I’m not sure it matches is O’Neill. You don’t have the sense, reading the script, with its earnestly described effects and fulsome stage directions, that something this chic could ever have been what he sought. The production’s international gloss — it is adapted from a 2015 production Jones directed for the Old Vic — identifies it more with the outlandish Fifth Avenue boutiques of the scenario than with the coal-dust miseries of the stokehole. That is part of its strength, considering the audience it is addressing, on Park Avenue if not Fifth. And strength, O’Neill shows us, is largely a matter of context, no matter how much muscle you have. It can be taken away in a minute. The Hairy Ape is at the Park Avenue Armory through April 22.